Angel investor and gun reform advocate Ron Conway became the main backer of the $1 million Smart Tech prize to spur gun safety solutions earlier this year. “Let’s use innovation to bring about gun safety. Let’s not rely on Washington,” Conway told the SF Examiner in January. According to the Smart Tech Foundation, a total of 15 innovators will receive a part of that million dollar prize. Kloepfer is the first to get the award. 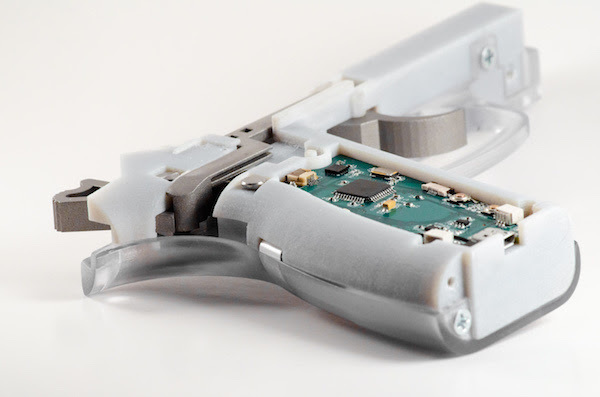 The gun works by creating a user ID and locking in the fingerprint of each user allowed to use the gun. The gun will only unlock with the unique fingerprint of those who have already permission to access the gun. The clearly brainy teen tells me he has an interest in information security. According to him, all user data is kept right on the gun and nothing is uploaded anywhere else so it would be pretty hard to hack. This potentially makes it ideal for military use as well. Kloepfer came up with the idea two years ago when he needed something for his high school science project. “The idea came to me right as I was falling asleep. It was kinda in the back of my mind because of the shooting,” said Kloepfer, alluding to the Aurora, Colorado shooting that had been on everyone’s mind at the time. The shooting was just an hour’s drive from his home. “I scribbled it down before I went to bed and fell asleep and then in the morning I began my research,” He explained. Kloepfer’s parents helped him in monetary increments to get the parts needed for each improvement. It would eventually cost $3000 for the whole thing to come together. “At first it was just a concept on paper,” he tells me. The gun went from phase to phase with each science fair. “Right now it’s a prototype on a plastic model. Its not entirely there but it works,” he says. Some of the $50,000 has already been used to purchase a 3D printer to create new parts for his prototype. Kloepfer, who will graduate from Fairview High School this year, plans to use the rest of it toward the integration of a fingerprint scanner. “Every 30 minutes in the U.S. a kid dies from a gun. I want my gun to help reduce accidental deaths and injuries, and to prevent tragedies,” said Kloepfer (Note: 1500 kids die from a gun and many more are seriously injured every year, according to the Center for Injury and Research Policy). He spoke about his biometric smart gun tech at the TEDx Mile High: CONVERGENCE this week in Denver, Colorado.